Miriam was born in Egypt. Her parents, Amram and Jochebed, were Hebrew slaves in Pharaoh’s work force. Miriam was the oldest of their children, and she helped care for her younger siblings. As a child, she was responsible, nurturing, and assertive. Sometime after Amram and Jochebed married, Pharaoh ordered a massive infanticide. He intended to control the slave population by systematically killing Hebrew male infants. Amram’s second child, Aaron, may have been born before the edict went into effect because he was already three years old when the story begins. The edict was in force, however, when the second son was born. Sympathetic midwives did what they could to save the infants, but Pharaoh eventually required all Egyptians to take part in the killings. When all Egyptians were on the lookout, it was difficult to conceal any boys the midwives saved. 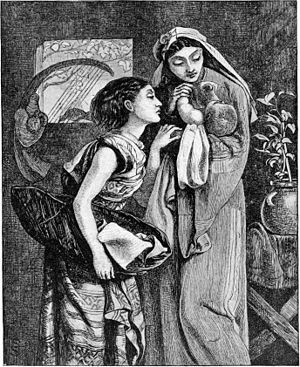 Amram and Jochebed were able to hide their son until he was three months old. What made it impossible for them to conceal him any longer is not known. Did they fear for their lives and the lives of their older children? Hebrew taskmasters working for Egypt lived among the slaves, and they were unmerciful. And some slaves informed on others in exchange for personal benefit. Moving their son to the river must have been an act of desperation. Did the family hope to save him a little longer? Did they think someone would rescue him? Was their only thought not to see him from their arms? I wonder if Jochebed placed her son in his tiny carrier before the family was awake? I imagine her going alone to the river at daybreak and wedging the basket among the reeds. I picture Miriam, unbidden, following and watching. Was she asked to keep watch or was it her way of caring? Miriam stood far enough away to keep an eye on things without drawing attention to the hiding place. Pharaoh’s daughter discovered the basket when she and her attendants came to the river. The infant’s crying moved the princess to lift him out of the basket. This is one of the Hebrew babies. Surely God inspired Miriam to come forward with a solution. Shall I go and get one of the Hebrew women to nurse the baby for you? Miriam brought her mother to the daughter of Pharaoh, and the two women made an arrangement. Jochebed was paid to care for the baby until he was weaned. At that time the princess adopted him and named him Moses, signifying that she had drawn him out of the water. Later in the story, Miriam appears at the celebration of Israel’s crossing the Red Sea. 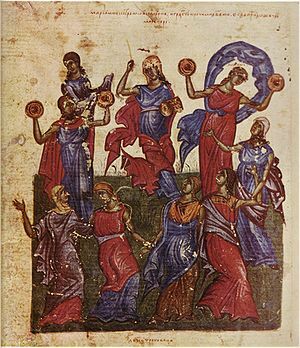 Moses led the people in a victory song in praise of God, and Miriam led the women in singing and dancing to a chorus she composed. Her song may have been presented in conjunction with Moses’ song or it may have been an expression of praise that only the women performed (Ex. 15:20-21). Based on extra-biblical material, some scholars believe that Miriam was married. Scripture does not refer to Miriam as a wife or mother. Josephus, in a brief reference, states that Miriam was the wife of Hur, an assistant to Moses. A number of Jewish resources state that Miriam was married to Caleb and they had a son named Hur. Herbert Lockyer points out that if Miriam were married to Hur, she would be “the grandmother of Bezaleel, the famous artist in the construction of the Tabernacle (Exodus 31:2).” If Miriam were married to either Caleb or Hur, then king David would have been one of her descendants. Because there is no scriptural proof that Miriam was married, Lockyer believes the Biblical record “suggests” she remained single. Miriam was a prophetess. Unsubstantiated Jewish traditions assert that Miriam received her first prophetic message as a child. In that message, she was told that her mother would give birth to a son who would deliver Israel from slavery. Scripture does not support the conjecture that Miriam had the gift of prophecy as a child. However, the LORD did speak through Miriam and Aaron as adults (Num. 12:2, Micah 6:8). 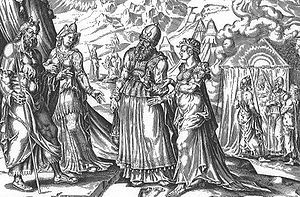 The issue of Moses’ wife was not the real reason Miriam and Aaron challenged Moses (Num. 12:1-15). Has the LORD spoken only through Moses? Hasn’t he also spoken through us? Although Lockyer characterizes their challenge as one of “jealousy” and resentment against Moses’ new wife, he states that Miriam and Aaron presented a great danger by sowing discord among the Israelites. In response of their attack on Moses, God called them to the Tent of Meeting. Listen to what I say: If there is a prophet among you from the LORD, I make Myself known to him in a vision; I speak with him in a dream. Not so with My servant Moses; he is faith in all My household. I speak with him directly, openly, and not in riddles; he sees the form of the LORD. So why were you not afraid to speak against My servant Moses? Posted in Bible women, jochebed, Miriam, Moses, Pharaoh's daughter, The exodus, Uncategorized. Bookmark the permalink. Great article Mary, I wonder if they have the dates right concerning her death because if she was at least 10-12 years old when Moses was born, then she would have been around 130 plus when she died as Moses was 80 when he started leading the children out of Egypt. But of course that is contingent on how old she was when Moses was born.